Last year was an absolutely fascinating time for world currency markets. 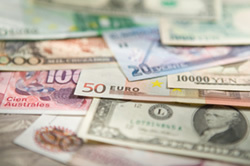 The yen, the dollar and the euro all took their turns in the spotlight. Each experienced wild swings at various times, but the overall theme that we saw was that faith in paper currencies is dying. The biggest reason for this is the horrific sovereign debt crisis that has swept the globe. The United States, Japan and a whole host of European nations are all drowning in debt. The U.S. and Japan are both steamrolling toward insolvency, and several European nations would have already defaulted on their debts if they had not been bailed out. So which of the major currencies of the world is going to crash first? Will one (or more) of the big currencies fall before the end of 2011? Once one major currency collapses will the rest start to fall like dominoes? The truth is that the world has never seen a sovereign debt crisis of this magnitude in all of human history. Almost the entire globe is drowning in a sea of red ink and it has brought us right to the brink of financial disaster. So which of the currencies of the world is going to be the first to come crashing down? Well, let’s take a quick look at the yen, the euro and the dollar…. Japan has the 3rd biggest economy in the world, but they are also deeply swamped in debt. At well over 200%, the Japanese government has the biggest debt to GDP ratio of all of the major industrialized nations. In fact, it is estimated that this massive pile of Japanese government debt amounts to approximately 7.5 million yen for every person living in the entire nation of Japan. So why hasn’t Japan defaulted yet? Well, a big reason is because Japan has one of the highest personal savings rates on the entire globe, and Japanese citizens have been more than happy to gobble up huge amounts of Japanese government debt at very, very low interest rates. However, Standard & Poor’s has warned that they may have to slash Japan’s credit rating if the debt gets much bigger, and once confidence starts to falter Japan is going to have to start paying higher interest rates. At some point Japan is going to be facing a financial meltdown, but for the moment they are hanging in there. Several large European nations would have already defaulted on their debts if they had not been bailed out last year. Greece, Portugal, Ireland, Italy, Belgium and Spain are all on very shaky ground right now. Several of them have already had their credit ratings slashed. Bond yields all over Europe have been absolutely soaring in recent months. It is getting really expensive for many of these nations to take on new debt. Interest rates on 10-year Greek bonds went from 6 percent up to 13 percent in just a single month at one point in 2010. In fact, even some of the nations that aren’t in the most danger are even feeling the pain. For example, the cost of insuring French debt hit a new record high on December 20th. Right now there are all kinds of rumblings that more European nations are going to need bailouts very soon. Professor Willem Buiter, the chief economist at Citibank, is warning that quite a few EU nations could financially collapse in the next few months if they are not rapidly bailed out…. So where is all of this bailout money coming from? Well, a lot of it is coming from Germany and a significant amount of it is actually coming from the United States. But will wealthy nations such as Germany be willing to pour hundreds of billions of euros into these financial black holes indefinitely? Are the Germans going to accept a situation where they are permanently bailing out the “weak sisters” all over the rest of the continent? Already some prominent politicians in Europe are calling for the European “bailout fund” to be doubled in size to about 2 trillion dollars. Other analysts believe that it is going to take at least 4 or 5 trillion dollars to properly bail out all of the European nations that need it. In any event, the truth is that the situation is really, really bad. If at some point the bailouts stop, the defaults are going to begin. The United States has the biggest national debt of all. The 14 trillion dollar threshold has just been crossed, and the national debt is now less than 300 billion dollars away from the 14.294 trillion dollar debt ceiling. If the U.S. Congress does not raise the debt ceiling, the U.S. government will shortly begin to default on its debts. Of course everyone fully expects that the U.S. Congress will indeed raise the debt ceiling just like they have every time before. However, U.S. politicians are not going to be able to keep kicking the can down the road forever. Today the U.S. national debt is more than 14 times larger than it was just 30 years ago. Everyone around the world is beginning to realize that this debt is not even close to sustainable. Investors are beginning to become more hesitant about loaning the United States money. The Federal Reserve has been forced to step in and “buy” more and more of the debt the U.S. government is issuing. Yields on U.S. Treasuries have been moving up in recent months and this could eventually become a huge problem. Well, the sad truth is that the U.S. government has been increasingly using short-term debt. At this point, the average maturity of U.S. government bonds has fallen to 4.4 years. The is the lowest figure of all the major industrialized nations. That means that the U.S. government must constantly roll over massive amounts of debt. As a point of comparison, UK government debt has an average maturity of approximately 13 years. That obviously gives them a lot more breathing room. For the United States, the situation could become incredibly dire if interest rates start to go up. If interest rates on U.S. government debt reach an average of 7 percent, interest payments on the debt would gobble up approximately 45 percent of the tax revenue that the U.S. government takes in each year. Yes, at that point the game would be over. But what the United States has going for it that the European nations do not is that the United States can just have the Federal Reserve keep printing currency. Unfortunately for the nations involved in the euro, they do not have that option. That is why an increasing number of analysts believe that it will be the euro that will crash and burn first. There are even many that believe that authorities at the highest level actually want the dollar, euro and yen to fail. Well, many of the same individuals and groups that brought us NAFTA, the WTO, the IMF, the OECD and the World Bank believe that it would be absolutely wonderful for humanity if we could all have a single, united global currency. The “chaos” produced by the fall of our existing global currencies could provide the perfect “opportunity” to provide the grand “solution” that they have been hoping to introduce all along. So will the American people just sit back and accept it when their dollars are replaced with a new global currency? Well, sadly, when things go badly most Americans seem to be willing to accept just about anything if it will mean that things will go back to “normal”. When the global economy falls to pieces, and there already lots of signs that we are on the verge of such a collapse, will the American people be willing to say goodbye to the dollar if politicians from both major political parties tell them that the new global currency is the “answer” to our problems? Hopefully the American people will wake up and will realize that “globalism” is rapidly wiping away almost everything that it means to be an “American”. Now even many of our children and teens are primarily identifying themselves as “citizens of the world” rather than “citizens of the United States”. Even if the U.S. dollar does collapse, it is absolutely imperative that we continue to have our own national currency. The U.S. Constitution does not make any provision for any sort of “world currency”. If we allow the globalists to push a truly global currency down our throats it will be another giant step towards the creation of a totalitarian one world system. So what do you think about all of this? Please feel free to leave a comment with your thoughts below….